This easy, delicious and healthy quinoa salad is full of flavor and makes a great side dish or main dish meal! Since the start of the new year I've really been focusing on my healthy habit goals. One of those goals was to eat more fruits and vegetables, and another was to eat more whole grains. An easy way for me to fulfill the veggie goal has been eating salads. I LOVE salads, and more often than not I have a side salad with my dinner. Luckily, my kids like salad too, so it's been a great way for us all to up our veggie intake. I've recently been experimenting with quinoa and recipes to make with it. 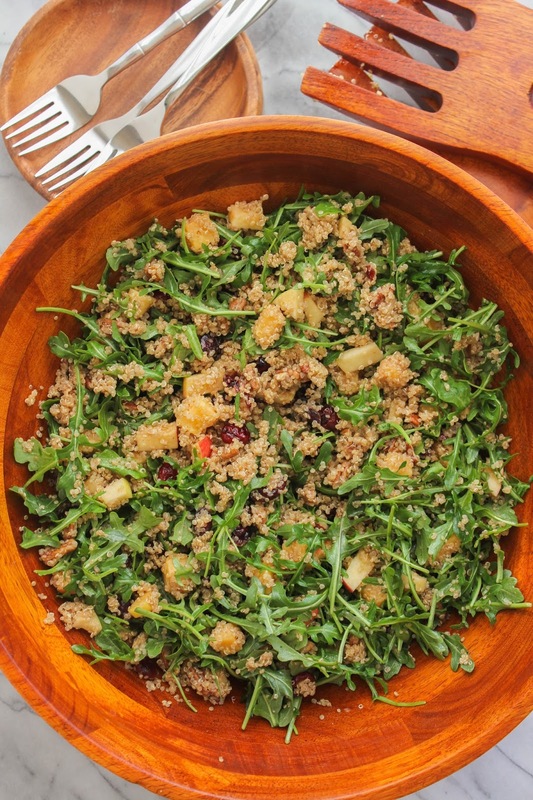 Quinoa is a wholesome grain that's a great source of fiber and protein. It has a mild taste and a bit of crunch, so it's perfect in many dishes. 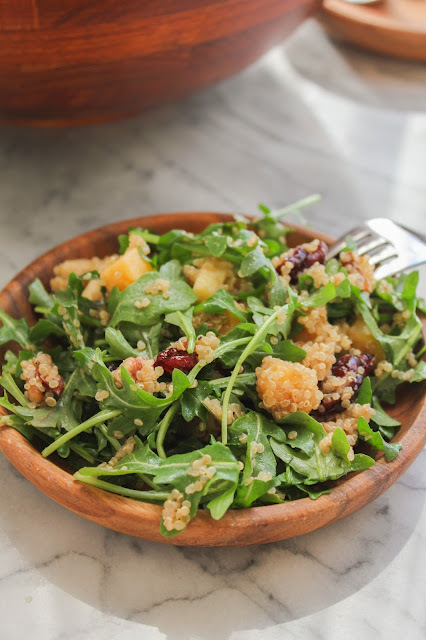 This Quinoa Salad with Apples, Pecans and Dried Cranberries also has spicy arugula and super flavorful and nutty Gouda cheese in it, and it's quickly become my favorite winter salad. The combination of flavor profiles in this dish is what makes me love it so much. Salty, sweet, spicy and savory, this salad has it all! Topped with a super simple dressing, it's a powerhouse salad in my book. Lucky for you (and me, too! 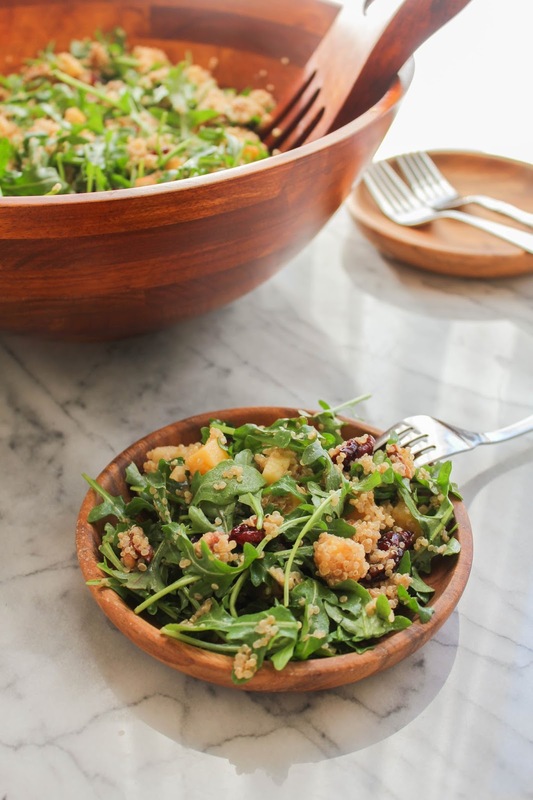 ), my Sunday Supper friends are also sharing their favorite winter salads today. 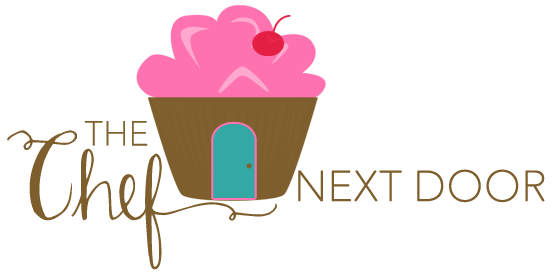 Scroll down to find more amazing recipes! I can't wait to try each and every one for myself. In a large bowl, rinse the quinoa with water and use your hands to wash it. Drain the quinoa and transfer it to a large pot. Add 2 1/2 cups of water and a pinch of salt and bring to a boil over medium-high heat. Reduce the heat to low and and simmer, covered, until the quinoa is tender, about 15 minutes. Drain the quinoa and place it in a serving bowl. Stir it to spread it out evenly and allow to cool for about 20 minutes. 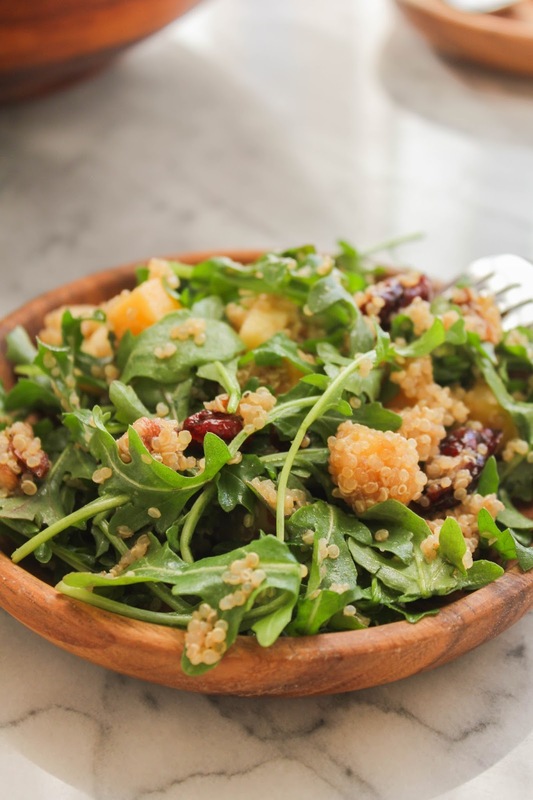 Add the arugula, cheese, apple, pecans and cranberries and toss to combine. In a small bowl, whisk the balsamic vinegar and olive oil. Add 1/4 teaspoon each salt and pepper and mix to combine. Pour the dressing over the salad and gently toss it. Season to taste with salt and pepper.